Seventeen-year-old Elia Hand is no stranger to suicide. She lost her uncle and a close friend, and nearly lost another, to suicide. As the beginning of this school year, one of Elia’s friends confessed she, too, thought about killing herself. Elia helped her friend get the help she needed and that friend is doing better today. “I realized if I can do that for one person, I can do that for many people,” Elia said. She took on this global issue for her senior project at Mazama High School. 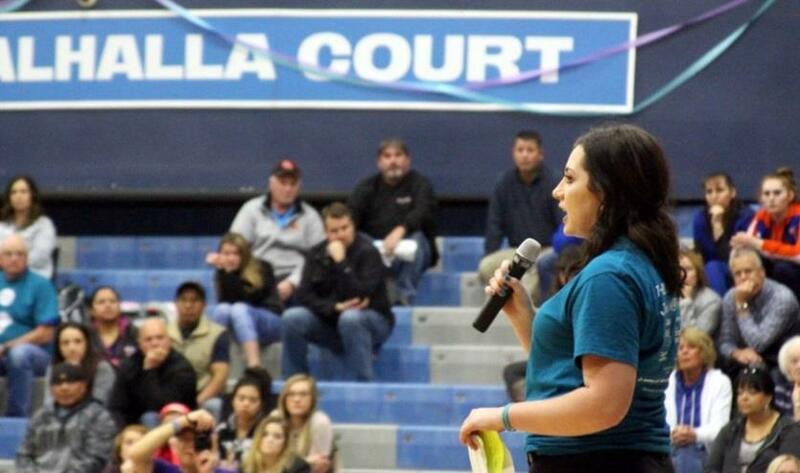 On Tuesday, Feb. 6, she organized an the “You Matter!” event at the Mazama High basketball games to tell all her fellow students and community members, suicide is an issue that needs to be addressed in the Klamath Basin. On Tuesday, local organizations hosted booths during the games, she gave away more than 250 T-shirts and Elia and others spoke during halftime of the boys’ game. On the front of the T-shirts were the words “You Matter” encased in a semicolon. The semicolon is recognized as an anti-suicide symbol. Just as an author can choose to end a sentence, but instead uses a semicolon to continue, a person can choose to continue his or her life instead of choosing suicide. Elia is also part of a new Suicide Prevention Committee, a partnership between Mazama High School, Henley High School, Klamath Union High School and community organizations. It is working to organize presentations by NAMI (National Alliance on Mental Illness) at the three large high schools, and Hands and Words are not for Hurting assemblies at more schools. Mazama High School Vice Principal Randy Rose said suicide is especially important to Mazama this year, as the school lost one of its students to suicide at the beginning of the school year. “It hit all of us very hard,” he said. Elia said her ultimate goal was to get the message out and start the conversation. She believes by hosting the booths and by giving away the shirts, she will have that effect.